After the annexation of Estonia, the Red Army occupied the country and absorbed military equipment into the Red Army. 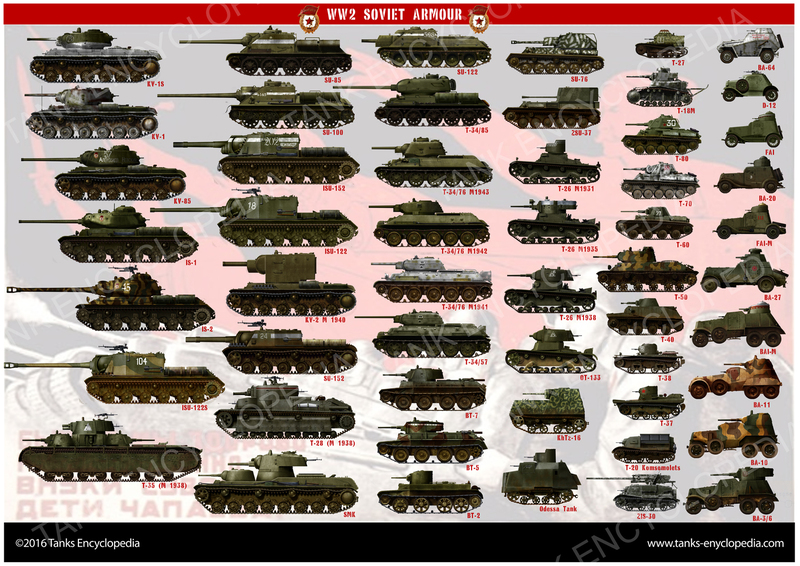 After the bloody nose that the USSR was dealt by the Wehrmacht, the Army and Navy were desperate for armor. The Navy’s solution was to create an improvised armored lorry based on an Austrian ADG truck. It featured a large, armored crew compartment, and a small turret armed with a machine gun. Unfortunately, due to the nature of this conversion, there is very little documented evidence of its history. The vehicle doesn’t even have an official name. Some suggested are: “Soviet Naval ADG”, “ADG-R” (ADG-Russian), or perhaps simply Improvised ADG, however this article will refer it to as the “Armored ADG” for simplicity. What is known about this truck however, is that it is of Austrian heritage. In 1911, the Daimler Motoren Gesellschaft absorbed the Austrian Motor company Osterreichishe Automobil Gesellschaft. 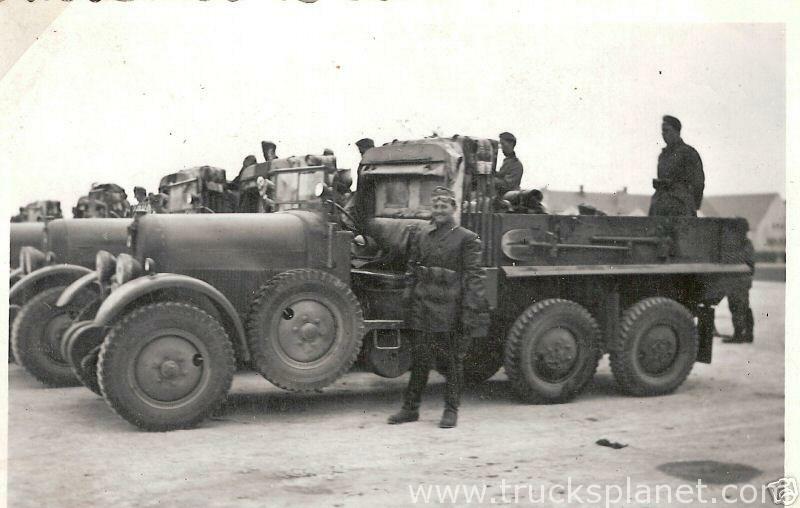 Under this partnership, the company began to produce trucks for civilian use and Imperial Army use. 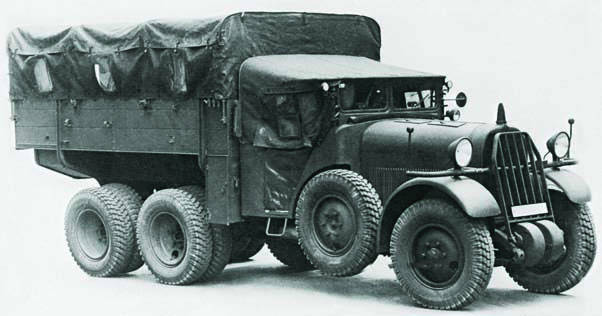 In 1932, Austro-Daimler (AD) began work on a new 4×6 three axle design truck. This truck had many modern features including a longitudinal sprung rear suspension with two wishbones. this meant that the truck was very maneuverable over rough terrain. This new truck was powered by a 6-cylinder petrol engine that produced 65 hp, and boasted seven forward and three reverse gears. An ADG truck. Note the placement of the spare tire with the arched cab side guard. This was a defining feature of the ADG series. Also note the single wheel per rear axle shaft. The ADGR had two wheels per axle shaft. It was called the ADG, however after 1936, the design was reworked slightly to become the ADGR. The ADGR is discernible by the twin sets of rear wheels, rather than one. Other variants include the ADGK and the ADGT, the latter being a fuel truck. In all, 185 ADGs and 361 ADGRs were built between 1932 and 1940. After the German occupation of Austria, the AD company was merged with Steyr. The Steyr variant of the ADG was called the Steyr-640. Photographs of this truck exist in operation with Wehrmacht units, mainly on the Russian front, and one survives today in the Austrian Military Museum. ADGR with the protective tarpaulin deployed. Unfortunately this is where the the story becomes hard to trace. The only available records seem to show that the only foreign nation to purchase ADGs was Romania. After the Molotov-Ribbentrop Pact of 1939, the USSR was given free reign to administer authority over Estonia, so the Soviets invaded on 16th June, 1940. Much of the Estonian military surrendered immediately and much of the Estonian military hardware was put into storage. Only the Estonian Independent Signal Battalion stationed in Tallinn at Raua Street were resistant. The German invasion of the USSR a year later, on June 22nd 1941, was a massive surprise to the Red Army. Scores of vehicles were lost, all of which were needed desperately for defense. It was at this time that the Estonian people rose up against the NKVD, in an Estonian nationalist group known as “The Forest Brothers”. One source claims that the “Zagradotryad” Shipyard in Tallinn created at least two “police” vehicles to suppress the uprising. It is likely that this vehicle is that police vehicle, seeing as though Russian letters can be seen on the side of the lorry. 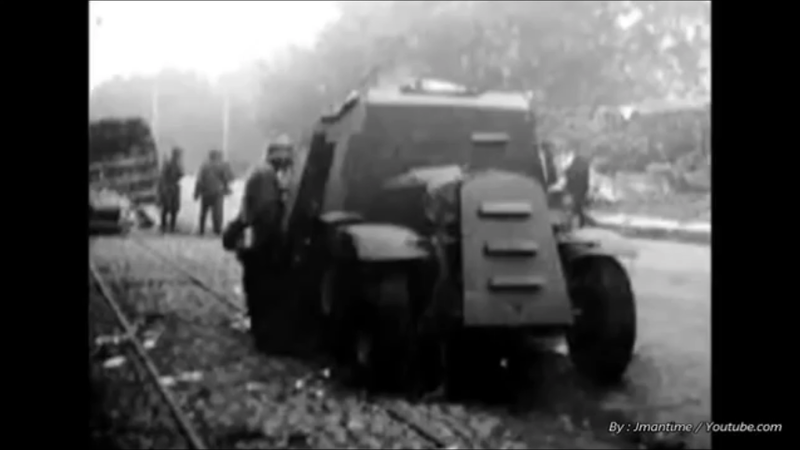 From the relevant photographs of this “Armored ADG” it can be seen that it was probably operated by Soviet Naval personnel – one photograph in particular appears to have dead naval troops hanging from the entry hatch of the vehicle, their black uniforms and helmets fairly clear. 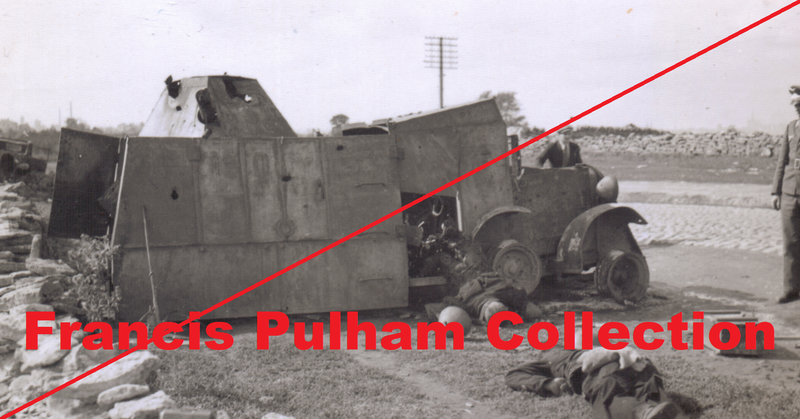 The vehicle is believed to have been operated in June, 1941. In the writing of the article, two other theories have surfaced as to the vehicle’s origin. Originally, it was thought that this vehicle might belong to the Forest Brothers – partisans operating in Latvia and Estonia. 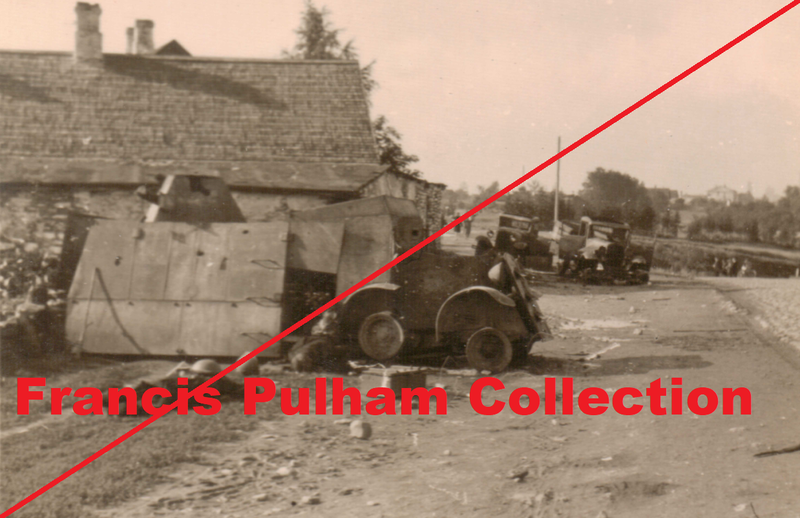 The suggestion was that the German 18th Army, which fought alongside these partisans, might have donated the ADG truck to the partisans, who then armored it up. 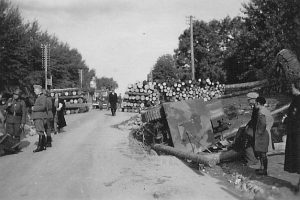 Similarly, it was also thought that there is a possibility of the armored lorry belonging to the Estonian Independent Signal Battalion stationed in Tallinn at Raua Street. However, this particular theory was speculative at best. It is evident from the photos that the rear section of the truck was built up into an armored superstructure, probably about 7 mm (0.28 in) thick. The new superstructure also featured a four-six sided turret with a Maxim machine gun, of which there were two different shapes, tall and thin, or short and wide. It is unclear how many were produced, but according to photos, possibly two (or three). The suspension appears slightly stressed due to the new superstructure, but it may be the case that the superstructure was just poorly fitted to the chassis, thus giving the illusion of the broken suspension. The “Armored ADG” seems to have been armed with a Maxim gun, with armor that was between 7-10 mm (0.28-0.4 in). If it was fighting against infantry, it is safe to assume that it would have performed relatively well, with “bullet proof” armor. It was armed with a machine gun, meaning this truck could have been an able opponent. However, against any form of tank or well-armed tankette, this machine would have been an abject failure because the armor would be insufficient against weapons of a caliber of 12.7 mm (0.5 in) or more. Indeed, one photograph of the “Armored ADG” appears to shows a penetration in the turret. The biggest drawback of this vehicle were its high silhouette, thin armor, and apparently crude construction. That being the case, it is safe to assume that this lorry was a true product of desperate times. It has been suggested that at least one of the vehicles was destroyed on the Peterhof Highway. It is fair to surmise that perhaps one was able to retreat with other Red Army units before the encirclement of Tallinn. It is reasonable to estimate that the truck would have been close to its load bearing capability with the additional armor and the improvised turret. Therefore, the “Armored ADG” would have been a very clumsy truck. While we have no definitive information on this improvisation, however the regular ADG’s were in themselves very good vehicles. With their double wishbone suspension, the rear drive wheels could move interdependently of each other, making terrain traversal very easy. It is unknown whether the extra armor on the side impeded the swing of each wheel arm, although it does look as though it was the case. The tall-turret Armored ADG Lorry. One of the “Armored ADG” lorries. This is not the official name as the truck conversion has no name. it is evident that the original chassis is under the armor plates. Note the curved pieces of armor that cover the tires, and the turret with four sides with a Maxim machine gun. Also note the two letters “дн” on the hull. The same “Armored ADG” as in the previous photo. Note the German soldier who is probably from the 18th Army. Also visible is a coating of white paint around the top of the turret. This would have been applied as an identification with friendly Russian units. It is this “Armored ADG” that would appear to have been on the Peterhof Highway. An “Armored ADG” with no turret. It is unclear whether the truck was issued without one or whether it was blown off. Note the driver’s vision slit in the cab and the air intakes on the nose. This “Armored ADG” is the same lorry as above. It is evident that this example was knocked out due to enemy action. Evident with corroboration with the above photograph that the hull suffered no less than three hits. Also note the damage to the turret. The engine appears to have small hits too, possibly one 37mm hit, and some heavy machine gun fire. This photograph appears to show the above “Armored ADG” moved to the side of the road to allow traffic to pass. Another photograph of the Styer/ ADGR conversion. Take note of the shape of the main turret. Source: Francis Pulham Collection. 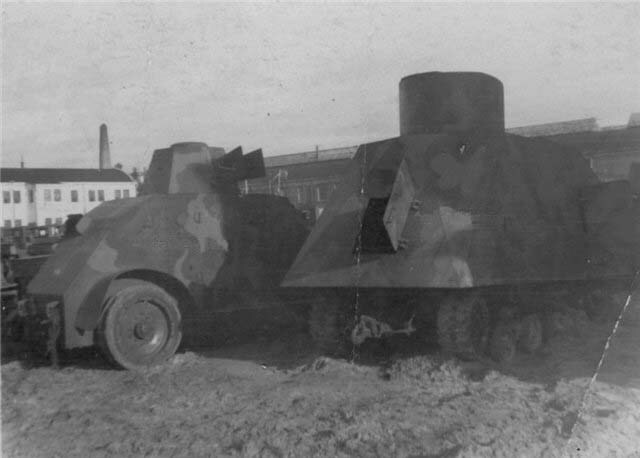 In addition, there is some evidence to suggest that Red Army forces also improvised other vehicles in Tallinn, such as a tractor tank based on the STZ-5. 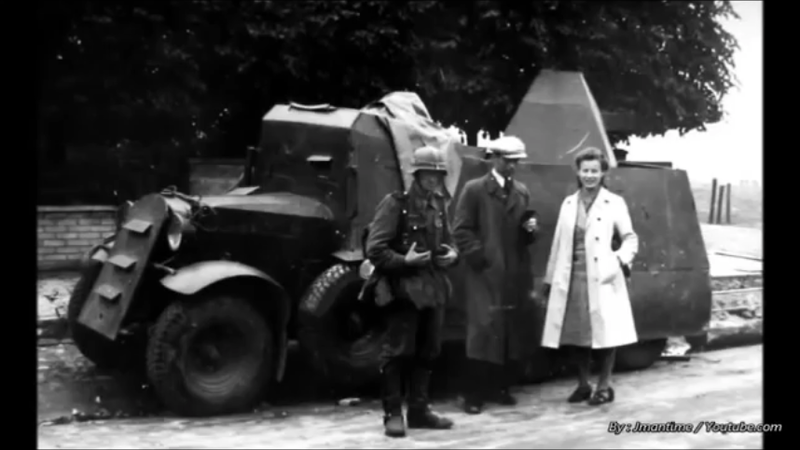 However, its history remains as unclear as this armored lorry, as there are only two known photos. 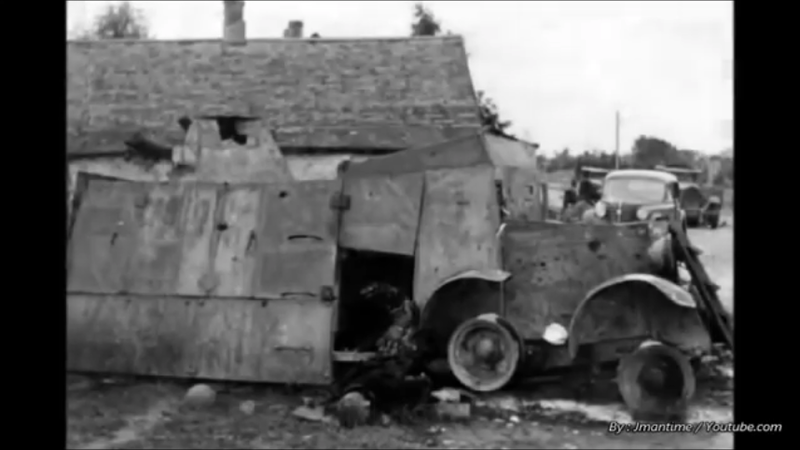 A rear view of what appears to be a tractor tank based on an STZ-5 next to an Estonian Arsenal Crossley armored car. The Arsenal Crossely armored car was considered obsolete, but was possibly taken out of storage to fight in the war and was given to the Estonian 22nd Territorial Rifle Corps, and one was sent to storage in Dvinsk. There are rumors of one serving at Leningrad. Seeing as though information is scarce, this leads only to speculation. It is rumored that this is a photo taken on Saaremaa Island, Estonian SSR, and a handful of improvised tanks based on the STZ-5 were built. It is also rumored that this photograph was taken at Leningrad. It is, however, much more likely that this was another policing vehicle made by the Soviet Navy at Tallinn and was deployed in the same manner to the Armored ADG. However, due to the lack of clear sources, none of the three claims mentioned can be totally substantiated. Seemingly another tractor tank, as in the above photograph. As mentioned, this is more than likely a Soviet Navy policing vehicle in Tallinn. It appears to have toppled over into a ditch and is being inspected by Germans and locals. The turret is facing the rear, and it is possible that it was trying to flee before it fell over. 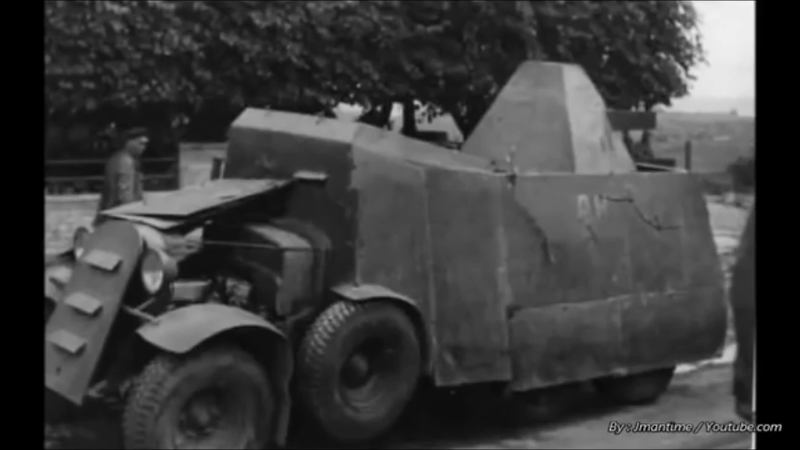 About “STZ-5 next to an Estonian Arsenal Crossley armored car” is possible that this car is Polish wz.29 captured by soviets in September 1939 and used after annexation of Estonia in Tallin.